Most developers have picked their favourite editor and/or IDE and use it many hours every day (and night). Still it can be quite useful to know what the free alternatives are. 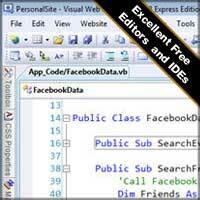 Some of the free editors and IDEs available are really high quality and may be worth investigating. If your manly using a large IDE it is likely that having a simple editor as well may improve your efficiency when just editing single files. The free alternative IDEs are also very powerful oprions and may beat some commercials competitors easily when it comes to feaures and easy of use. In this article tripwire magazine provides a list of more than 20 free Editors and IDEs useful for most developers. Let us all know if I missed a great product by posting a comment.